This story was updated at 10:55 a.m. ET. A defunct German satellite is expected to plunge to Earth this week, but exactly when and where the satellite will fall remains a mystery. The massive German Roentgen Satellite, or ROSAT, is expected to plummet to Earth on Saturday or Sunday (Oct. 22 or 23), though German space officials have also offered a wider re-entry window of between Oct. 21 and Oct. 25. This latest falling satellite comes about a month after a dead NASA climate satellite, called the Upper Atmosphere Research Satellite (UARS), plunged into the Pacific Ocean in late September. The 2.4-metric ton X-ray space observatory is expected to break up as it travels through Earth's atmosphere, but some large pieces will likely make it through the intense heat of re-entry. According to German aerospace officials, approximately 1.7 metric tons of satellite debris, consisting primarily of up to 30 large glass and ceramic fragments, could survive the journey through the atmosphere and reach the Earth's surface. There is a 1-in-2,000 chance a piece of ROSAT could strike someone on Earth, DLR officials have said. That's a slightly higher risk than the 1-in-3,200 chance of a debris hit NASA gave for the UARS satellite fall. ROSAT's orbit extends from the latitudes of 53 degrees north and south, which essentially covers a huge swath of the planet. This means the satellite could fall anywhere stretching from Canada to South America. Officials at Germany's space agency calculated a 1-in-2,000 chance that someone on Earth will be hit by ROSAT debris, but the risk of serious injury from such an event remains extremely remote. 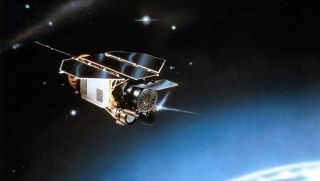 ROSAT, a dead space telescope that ceased operating in 1999, is expected to re-enter the Earth's atmosphere in late October, 2011. ROSAT was launched in June 1990 as a joint venture between Germany, the United States, and the United Kingdom. In 1998, the satellite's star tracker failed, which caused its onboard camera to be directly pointed at the sun. This permanently damaged the spacecraft, and ROSAT was officially decommissioned in February 1999. Since the satellite does not have a propulsion system, and there is no fuel left onboard, the satellite will make an uncontrolled return to Earth. "We expect public attention because it's a satellite coming down, but in history, we have had much bigger debris fall," Woerner said. On Sept. 24, NASA's UARS satellite fell uncontrolled toward Earth and plunged into the Pacific Ocean. The event captured the attention of people around the world, and ROSAT's impending re-entry will mark the second time a large spacecraft makes a publicized fall from space within two months. Officials at Germany's space agency studied NASA and the U.S. Air Force's response to the falling UARS satellite in order to prepare for ROSAT's final return to Earth. "For us, it was an advantage that UARS fell before," Woerner said. "We know now a little better how to interpret all the data and use the global network. It was an advantage that the satellite came down before so that now we can look at how to deal with ROSAT and how we deal with this in the future." This story was updated to indicate the mass of ROSAT in metric tons. You can follow SPACE.com staff writer Denise Chow on Twitter @denisechow. Follow SPACE.com for the latest in space science and exploration news on Twitter @Spacedotcom and on Facebook.